What happens to Lunar (or asteroidal) regolith if sunlight is concentrated on it? 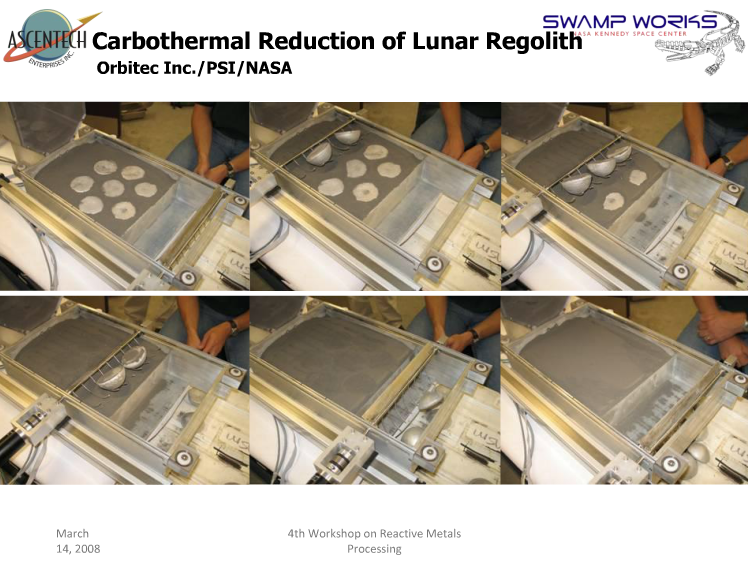 At 24:40 into this lecture, technology development scientist Laurent Sibille briefly describes an experiment done with a regolith simulant for Lunar Mare. The process of producing oxygen and reusing methane et cetera doesn't seem to be relevant to the actual melting of regolith to metal. Does the surface of the Moon really turn into solid metal if one simply concentrates sunlight on it? If that is solid metal, it must be easy to heat it again and use a centrifuge, magnetism or chemical reactions to separate the different pure metals. But for a landing pad or a road or most structures, maybe a random iron-magnesium-titanium alloy works very well? Thermal energy having turned regolith into apparently solid metal lumps. From a slide in Sibille's lecture at SSERVI. Browse other questions tagged isru thermal regolith sunlight or ask your own question. What is the average electrical charge on the lunar surface? The maximum depth Apollo astronauts dug into lunar regolith? Any regolith lunar samples tested for organics? What are the dangers of regolith? How deep is the regolith around this crater? What specific impulse can I expect from iron powder produced from lunar regolith? Why does NASA use Nitrogen storage for lunar regolith? How is sunlight simulated in spacecraft testing, given its brightness?